I've just recently watched the Dark Knight and I might be doing a post these upcoming days about the gadgets I found interesting on the movie. However, right now, I'm a bit confused and still wondering what The Dark Knight's Mobile Phone was. You know, the one Morgan Freeman had on him when he visited that Chinese guy in the movie and the one he gave Christian Bale, the one with the touchscreen. Now I know that Nokia is in partner with The Dark Knight producers since they're the ones launching the Nokia 6205 The Dark Knight Edition phone and there's a good chance that it was a prototype of the Nokia Tube that was used in the movie but the interface seems like that of Samsung or HTC's. Anyways, with all the touchscreen phones going around on the net and everyone trying to be iPhone like, it's hard to recognize which one is which. 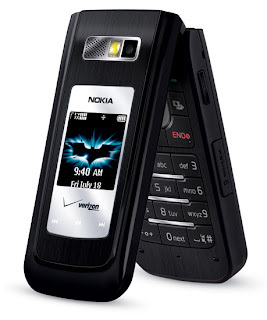 Anyways, The Nokia 6205 The Dark Knight Edition mobile phone will be coming exclusively to Verizon Wireless and sports a black color with the Dark Knight logo at the back of the phone. The Nokia 6205 is a flip phone and has touch sensitive external music keys similar to the one on Motorola's Razr2 series. Since this is a somewhat official movie merchandise phone, naturally, the phone has The Dark Knight theme from wallpapers, animated screen savers, voice ringtone, and preloaded with the full movie trailer. If that's not enough for you maybe you can download ringtones with the Batman Theme.